Now that you're getting the hang of standing at your workstation, vary your postures even more than you can with a traditional flat standing mat with the E7 Anti-Fatigue Mat by UPLIFT Desk. You'll still enjoy the same anti-fatigue support you'd expect to get from a standing desk mat, but with the E7, you'll get so much more than that. Let your feet wander and explore the mat's different valleys, peaks, mounds, and wedges to utilize specific muscles, stretching and exercising what needs the most attention. Step onto the sides to stretch the arches of your feet on massage mounds or step back onto the mat's power wedges to take some pressure off your heels. And if you really want a stretch, place one foot on the rest bar on the front and the other on a power wedge on the back to create a working power pose. When you're ready for multidimensional standing, step right up to the E7 Anti-Fatigue Mat. What is an "active mat"? An active mat has similar features to the anti-fatigue mat, but is slightly different in its design due to the valleys, peaks, and shapes on the mat that allow you to vary your posture even more than a standing mat. Wake up sleepy muscles and stand in better postures with the E7! Can I use this as standing mat? You bet! The E7 was designed to allow you to stand more actively, which is better for your body than simply standing in place. Improve circulation and even give yourself a foot massage just by switching up your stance on the mat. The middle of the mat is flat so you can stand stably when you want to. Power wedges are the two gently sloped platforms on the back of the E7 Active Anti-Fatigue Mat. 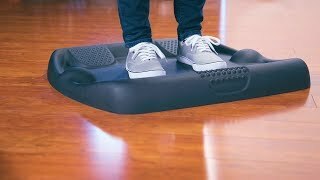 They have a textured surface that's designed to give your feet a surface to stretch and massage the muscles in your feet and legs. To use, simply step back onto the platforms and stretch your calves by leaning into the wedges for more or less pressure where you want it. What are these mound-like things on the mat? Those are massage mounds and they stretch the arches of your feet. To use, put one foot (or both) on the mound and lean into it a bit, directing pressure where you need it most. Does this work with high heels? Because the mat is not flat throughout, we do not recommend wearing high heels or tall shoes on the E7 Active Anti-Fatigue Mat. yep! it helps me to not feel too quickly a fatigue in my legs or soles. I am pleased I could fit the large mat under my desktop.